Adventure games make up a huge part of the entertainment software market, so large a part, in fact, that they've spawned a sub-market that's filling many a company's coffer with cool, green cash. We're talking, of course, about the business of selling adventure clues. It didn't take game developers long to realize that customers would pay goodly sums to obtain relief from the "brick wall syndrome"; so the manufacturers themselves became the first to sell hints and solutions to trembling, weary-eyed adventurers. Several years ago a company known as Arrays, Inc. released a book titled The Book of Adventure Games. It was an immediate hit and can now be found on adventurers' bookshelves across the nation. The people at Arrays snatched up part of the hint-pushers market by supplying clues and solutions to dozens of games within the pages of a single book, at a price less than that of three Infocom single-adventure hint books. They were so successful that it wasn't long before The Book of Adventure Games II made its way into the public's eye. And wherever you find success and money changing hands, you'll find imitators. 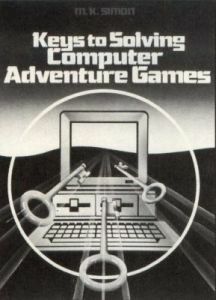 Prentice Hall quickly scooped up a manuscript called Keys to Solving Computer Adventure Games (hereafter referred to as Keys), and, by providing clues to new games not covered in previous books, gave Arrays, Inc. some competition. Keys was written with Apple computers in mind, and so, not surprisingly, all twenty-five games represented are available on that machine, while only twelve are also ST titles: Black Cauldron, Borrowed Time, Brimstone, Crimson Crown, King's Quest II, Leather Goddesses of Phobos, Nine Prices in Amber, Oo-Topos, Spellbreaker, Tass Times in Tonetown, Transylvania and Trinity (8-bit users will find only five games of interest to them). For ST people, that comes to $1.66 per game, still a good value. The book is divided into three sections. The first gives the reader complete adventure maps, including exits and room descriptions. Help is organized by placing a hint number in the room with the puzzle. This number is used to look up a clue in the list provided in this section. This clue is another number used to find the actual hint in the master clue list, section two of the book. There are 911 clues in the master list. Wow! The third section supplies the stymied adventurer with complete solutions (or "walk-thrus" as they're frequently called), leading the player step by step through a game. Not all the games are represented in this section, since those included are, in the author's words, "games where it is possible to define unique solutions and which. . .are sufficiently complex as to warrant its inclusion." ST users will find walk-thrus for all games except Brimstone and King's Quest II. Also included in the book is a chart showing which games are available on which computers (Apple II, IBM PC, Macintosh, Commodore 64/128, Amiga, Atari XL/XE, Atari ST, TRS 80 and Tandy 1000). That'll help those with other systems (in addition to their ST, of course!) decide whether the book will fit their needs. Also, there's a short user's guide that explains how to use the book and a "Tips on Playing Adventure Games" section that'll help novices get up to speed with their adventuring. Those of you with an interest will find Keys a good example of what can be accomplished with a desktop publishing system. The entire book (except for the table of contents and copyright page) was obviously "typeset" using one of those marvelous new software packages. And, although the quality of the text is less than one would expect from a regular typeset book, it is, nonetheless, an impressive job, especially on the maps. There's no clue as to what software the author used (if indeed it was the author) to set up the book, though it was undoubtedly done on an Apple II, since that's the author's chosen machine. Like its predecessors, this book is a fine value for all adventure fanatics, providing a cure for frayed nerves, short tempers and suicidal tendencies. At $19.95, it's cheaper than punching out your monitor and more sensible than screaming at loved ones. Pick it up, find out how to get that Babel fish, then you too can stop kicking the dog.